Orchid plants, known botanically as orchidaceae, come from a vast family of perennial flowering plants with over 20,000 species and over 100,000 natural and hybridized cultivars. Amongst these varietals, many thousands of the plants produce pure white blooms, or blooms that are white combined with one or more other hues. 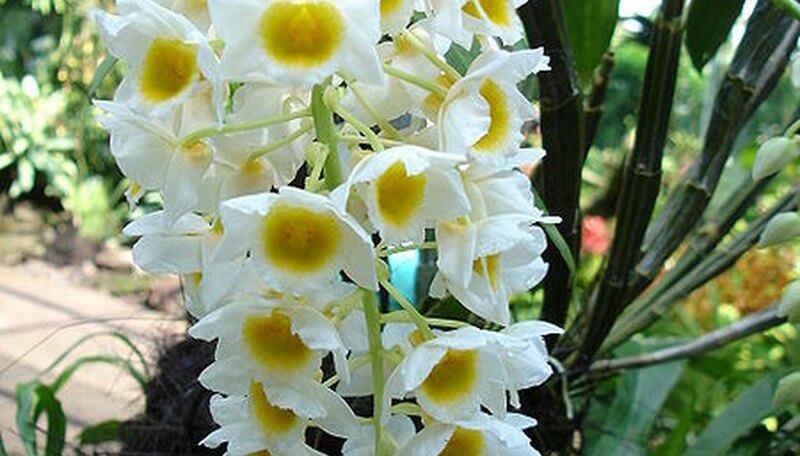 Some of the white orchid species most commonly available in retail settings include phalaenopsis, dendrobium, paphiopedalum, cattleya and cymbidium orchid plants. Provide a growing location that has bright to gentle indirect light according to the species preferences. Never place your white flowering orchid in direct sun, as it can burn the leaves and blooms and dry out the plant rapidly. When in bloom, the plants can be placed in low light conditions for a few weeks at a time, which may help to preserve the bloom spike over a longer time period. Water your orchid once every 5-7 days as needed to keep the potting medium just barely moist or slightly dry before watering again. Watering frequency will vary by climate and by species but this rule of thumb works for the most commonly available plants. If you are in a dry climate or using air conditioning or heating mist your orchid plant daily with water. For a lower maintenance way to raise the ambient humidity, place the orchid pot on top of a shallow tray or dish of stones and filled with water. Replenish the water as it evaporates. Fertilize your orchid once a month with a water soluble high nitrogen orchid formula. Pour the diluted fertilizer solution over the plant roots that have already been wet with water. Follow the fertilizer directions to determine dose and always err on the side of less fertilizer as over-fertilizing can damage the roots and shorten the life of the bloom. Pot and re-pot your white orchid in the potting medium that its species calls for. If you have an ephiphytic orchid that grows on a tree surface in its natural setting use an orchid bark mix with charcoal and perlite but no soil. It your white orchid is a terrestrial species and grows in the ground use an orchid potting mix with bark, charcoal, perlite with the addition of soil and/or peat moss. Epiphytic orchids prefer a mix that is lighter, airier and holds less moisture, while terrestrial orchids enjoy a bit more moisture and material blanketing the roots. Cut back the flower spike at its base after the bloom fades and the flower stem has browned and desiccated. Allowing the stem to die back before removal allows the nutrients in the stem to flow back into the plant. While it may look unsightly for several weeks it will help with the odds of reblooming. Re-pot your orchid plant every two to three years increasing the pot size incrementally by an inch or two inches but no larger to prevent swamping the roots. Slide the plant out of the old pot gently and brush off all of the old bark or potting soil that stick or has become entangled in the roots. Add a few inches of fresh potting mix to the new pot, set the orchid down into the pot and fill in around the roots well with orchid mix. Drench with water to settle the new medium and top off with more orchid mix if needed. Refrain from touching the blooms of orchids and white orchids, particularly as the oils and micro-organisms on your fingertips can cause a reaction in the orchid and discolor the blooms or cause premature wilt.